Monday evening in Atlanta and I was craving kushiyaki, more specifically chicken skin kushiyaki. Ah, chicken skin, the oh so maligned part of the chicken anatomy that ranks near the oyster as my favorite. To think of the countess Americans that buy boneless skinless chicken breast and deprive themselves of that hard earned flavor, but I digress. Unfortunately, both Jennifer and I’s favorite Atlanta kushiyaki vendor, Shoya Izakaya, is closed on Mondays and with our last visit to Miso Izakaya ending lukewarm at best, we were at a loss about where to go. 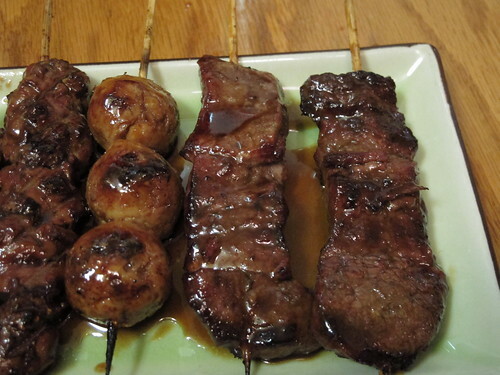 Through either a stroke of fortuitous googling or a sudden jolt of memory, Jennifer told me to look up Yakitori Jinbei. 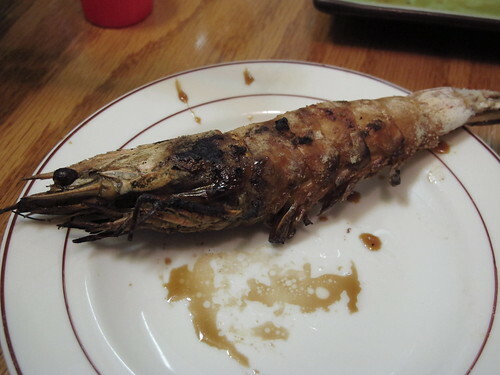 Quickly concurring, we were soon on our way to Smyrna and the little strip mall that Yakitori Jinbei calls home. As is the case with Jennifer and I at nearly any Asian meal, this one began with a few dumplings. 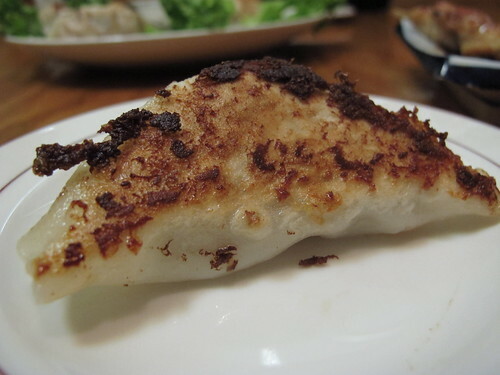 Served five to an order, these were sizeable albeit pricy gyoza. A delightful starchy char on the bottom is always a welcome sight. 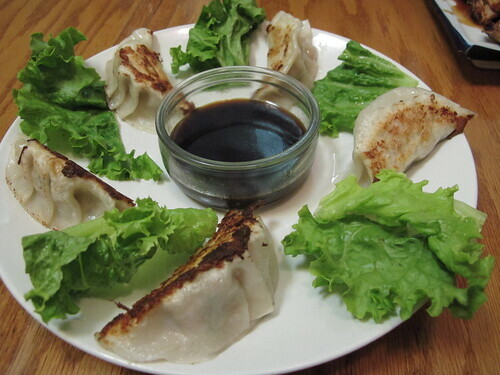 With a big, juicy pork, scallion, and ginger filling, the gyoza were simple yet satisfying. 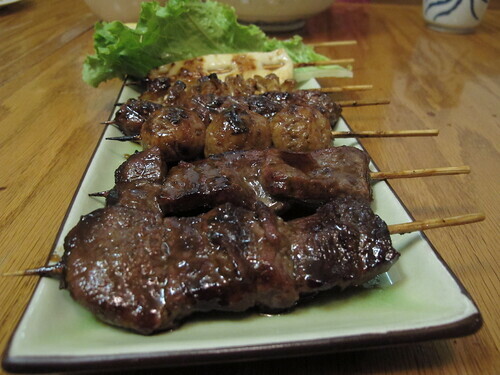 Before the first dumpling was finished, the first round of kushiyaki arrived. 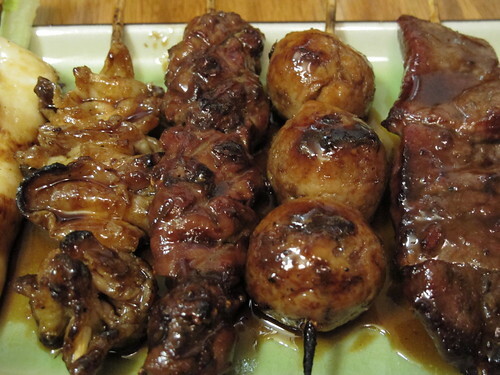 Coated in sweet and smoky tare, this yakitori and negima looked the part. 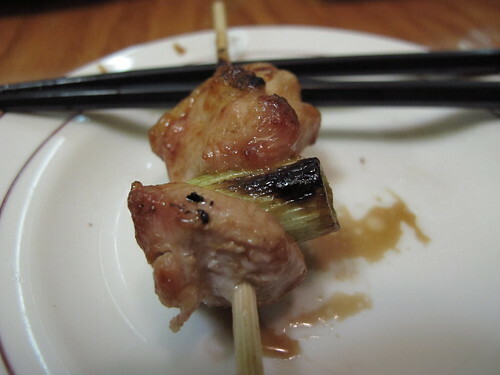 By itself, the chicken yakitori was little more than juicy thigh meat with a lacquered layer of tare. 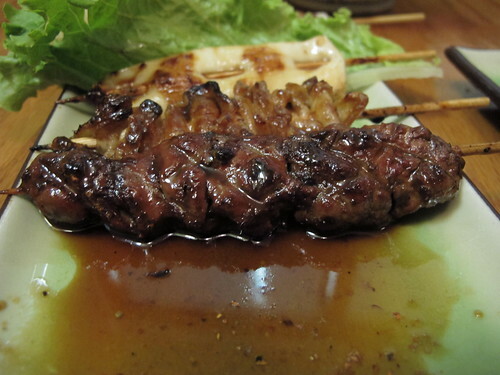 Surprisingly closer to underdone than over, this yakitori ticked the right boxes. but even with a deeply charred onion, there was a welcome green punch to the sweetness and char of the chicken. 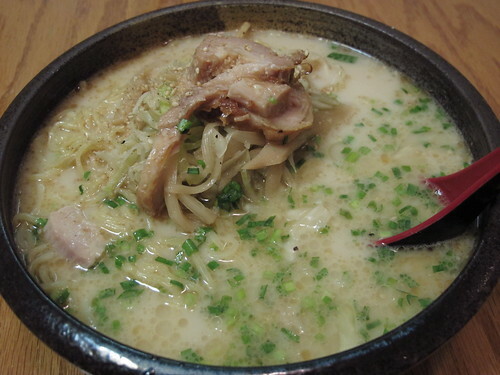 Following the lead of the myriad Atlanta food bloggers before me, I made sure to order the tonkotsu ramen. I may have read recipes and descriptions, but I wasn’t quite prepared for what was brought to me. Topped with sesame seeds, roasted pork, bamboo shoots, and seaweed, this pork bone ramen was a fat speckled, silky epiphany. I may be treading dangerously close (or jumping headfirst) to hyperbole, but this was a new benchmark in soup. The noodles were just the right amount of chewy, the broth was fatty and creamy, so very creamy, and the texture was nigh impossible to resist. In fact the only oddity to the dish was the roasted pork. 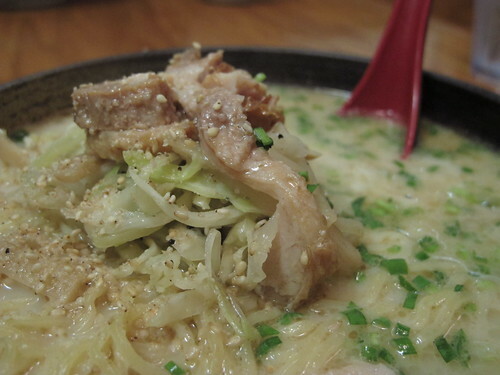 While the pork was undeniably sweet and nutty, I couldn’t figure out why it was served cold on top of a piping hot bowl of ramen broth. 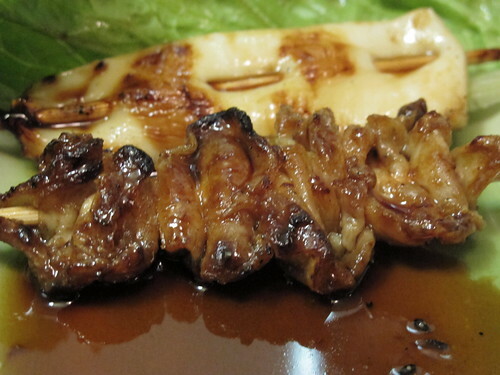 As sinful as the tonkotsu ramen may have been, kushiyaki waits for no man. Featuring of a fair chunk of Yakitori Jinbei’s yakitori menu, this plate was loaded with all manner of binchotan grilled and tare glazed treats. Though I’ll sometimes see beef tongue on a yakitori menu, this was my first time seeing gyukushi. Which cut of beef is gyukushi? I’m still not quite sure. However, after one bite, the cut was inconsequential. These were thick slabs of mercilessly overcooked beef that were frankly a waste of good meat regardless of how much tare was applied. 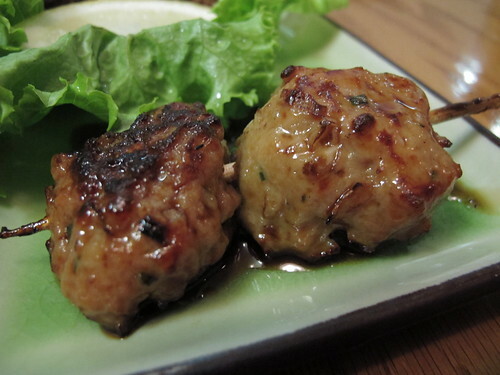 Next in line was a chicken meatball or tsukune. 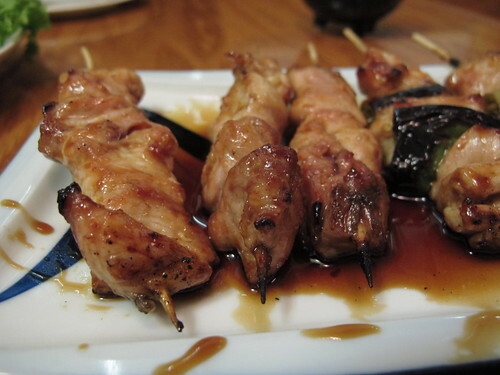 Much like the yakitori and negima, this chicken skewer was well seared and quite juicy with a meaty texture. 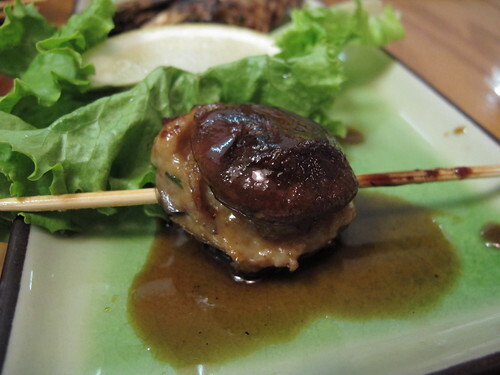 In contrast to the chicken meatball was the shiitake awaseyaki or chicken stuffed shiitake. The meat had a more uneven and handmade look to it, but I couldn’t help but wonder were the mushroom was. Comically small, the flavor of the mushroom in the skewer was subtle at best especially when compared to the dense flavor and texture of the chicken stuffing. Always on the hunt for well cooked liver, I had high hopes for the chicken liver or tori liver. Sadly, like the gyukushi beef, no amount of tare could mask the horrendous taste and texture of this liver. As best I can describe, this liver tasted like the cardboard textured gum you would get in baseball cards in the early 90s but dipped in tare. 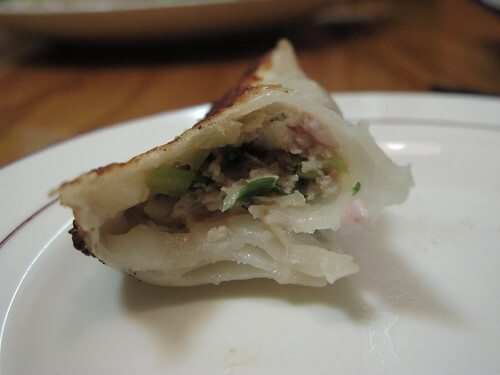 Grasping for fatty salvation, I moved on to the chicken skin or torikawa. 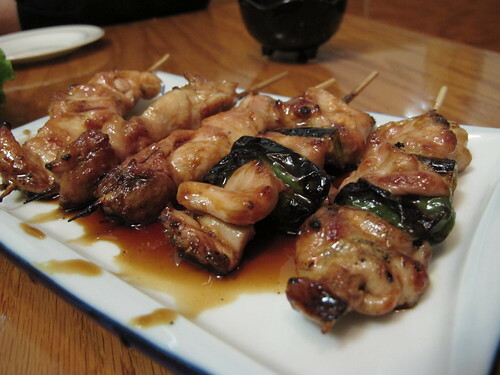 Lacking the sublime crunch of the Shoya Izakaya version, this chicken skin kushiyaki wasn’t quite up to par. That being said, there was still an ample amount of that crunchy, crispy edge and fatty interior that has made this one of my favorite kushiyaki skewers. 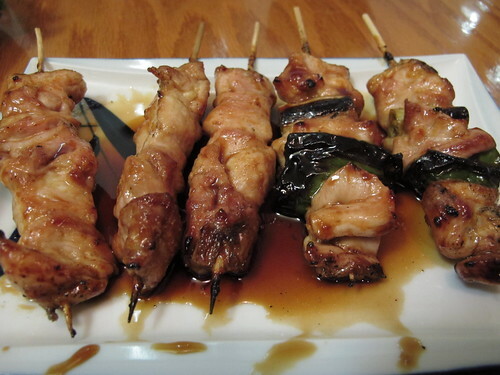 If only every skewer could balance crisp edges, rich chicken flavor, and a heavy tare sweetness this well. 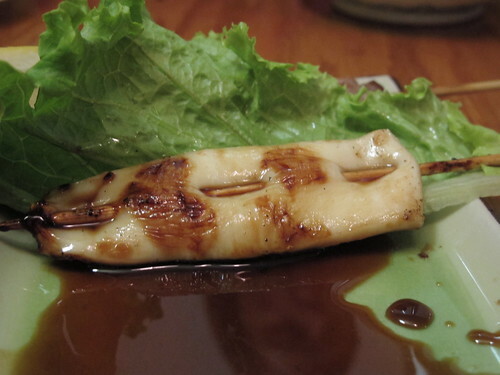 Standing on its own as the lone cephalopod, the squid or ikakushi was an interesting choice. Large, chewy, and meaty, this squid wasn’t too shabby. 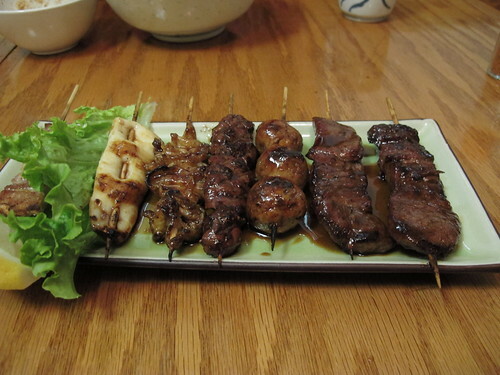 Nearing the end, the butabara pork was one of two skewers that I ordered salt only. Was skipping the tare a good choice with the butabara? If you don’t enjoy the simple flavor of pork then no tare was a poor choice, but for me, I was delighted by the lightly charred pork as it was porky, moist, and packed just the right level of salinity. 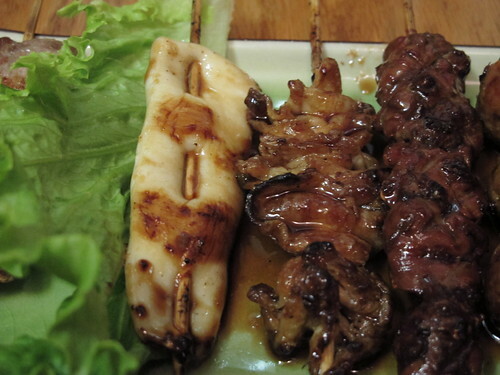 To wrap things up, the final skewer out of the Yakitori Jinbei kitchen was a grilled shrimp or ebikushi. 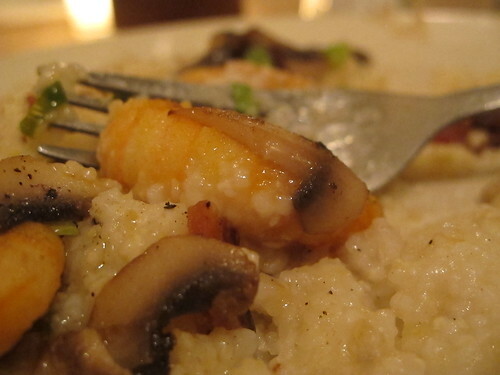 Sticking to the salt only ending, this shrimp had a well charred and very salty shell. As for the inside, it may have had a decent flavor but there was no denying it was completely overcooked. 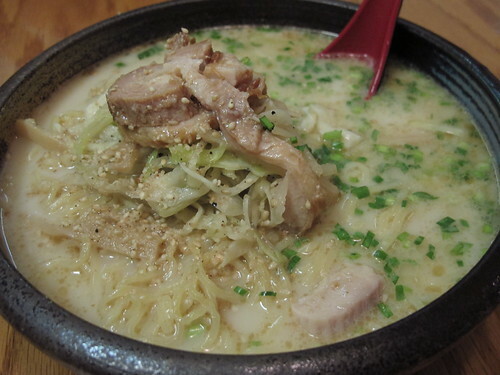 If there was anything I could take away from the first meal at Yakitori Jinbei, it’s that the title of 2010 best ramen in Atlanta from Creative Loafing was more than deserved. For this to be my first proper bowl of tonkotsu ramen, I fear that I may have started down a long path of obsession and my bite of shoyu ramen was no slouch either. Sadly, as I could gush for paragraph after paragraph about the tonkotsu ramen, it was more of a mixed bag with the kushiyaki. While every skewer involving chicken, save the liver, was exemplary, the poor textures of the liver, beef, and shrimp squandered nearly every bit of goodwill the chicken had earned. What it comes down to is that I would, without hesitation, drive across town and maybe even across a state or two for more of that tonkotsu ramen, but the kushiyaki is a different story. It’s hard to know where to begin with Sean Brock and Husk. Like most people interested in food, it’s been rather difficult to ignore the press he and his devotion to southern heritage cuisine have been receiving. It’s not often that a chef wins a James Beard award and is covered by Steingarten, The New Yorker, the New York Times, wins best new restaurant from Bon Appetit, and even gets a few plugs from a little Charleston based outfit called Garden & Gun (here & here). While I can't say that it's undeserved, I couldn’t help but wonder how much true substance was behind this wall of hype. Although I could spend hours reading about local ingredients, heritage breed animals, heritage plants, and the like, seeing and tasting is believing and I had the good fortune to be back in Charleston with a lunch reservation at Husk with my name on it. Why lunch reservations for a restaurant like Husk? It’s simple; since I was unable to secure a reasonably timed dinner reservation, I opted for the next best thing, lunch. With time to spare before that evening’s wedding, it was one drive from Kiawah Island and finding a spot in a parking garage before I was soon seated at a table for one for lunch at Husk. Like so many good meals, this one began with a cocktail. 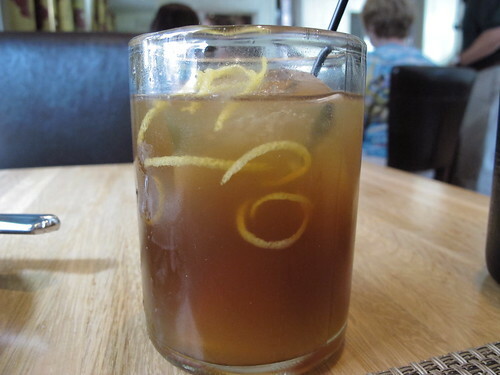 Taken from the Charleston Preservation Society, this Charleston Light Dragoon’s Punch was a refreshing mix of California brandy, Jamaican rum, peach brandy, Black tea, lemon juice, and raw sugar. Normally the bread is a forgotten course but the butter and a recent experience force me to mention it. 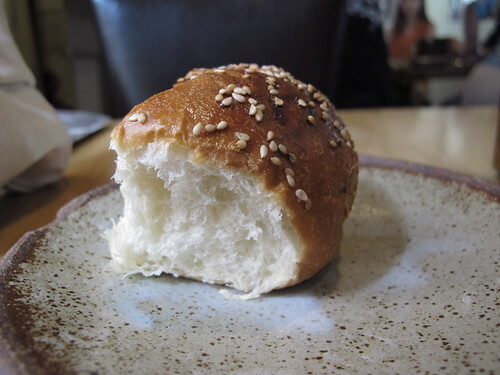 The bread at Husk, while excellent in its own right, was secondary to its dressing. Normally I would be bowled over by the mere mention of pork and butter but after an excessive experience with the stuff at Carnevino, I was wary. 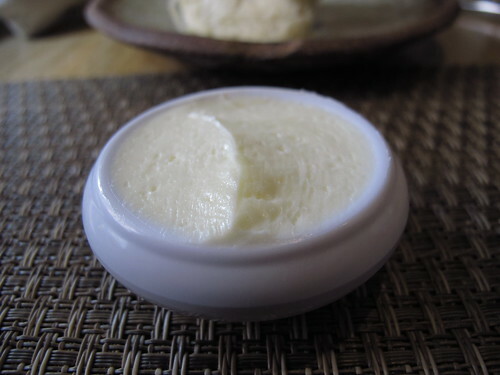 Thankfully, Brock and his team had a steady hand with their honey pork butter. Sweet with just a little more lip smacking texture than regular butter, it was miles ahead of Batalli and his crock of whipped lard. 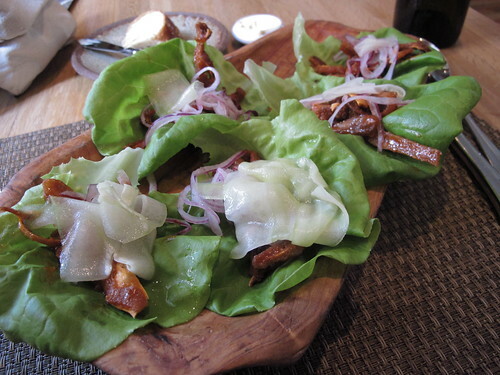 Knowing that my visits to Charleston are few and far between, I decided to make the most of this trip to Husk and go completely overboard in ordering by starting with crispy buffalo pig ear lettuce wraps. It’s interesting to imagine where buffalo pig ear with sweet vinegar marinated cucumber, red onion, and cilantro fits into Brock’s idea of exclusively southern products and ideas. 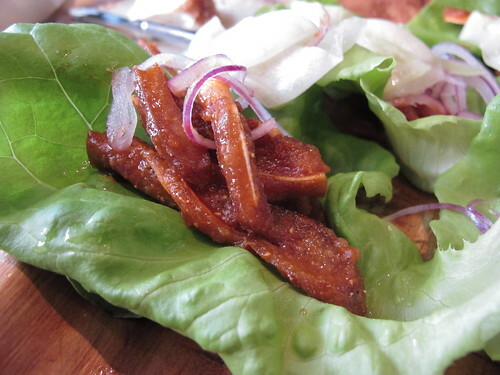 Regardless of the southern status of this dish, the intensely satisfying crunch of the crisp pig ears dispelled any qualms about its providence. 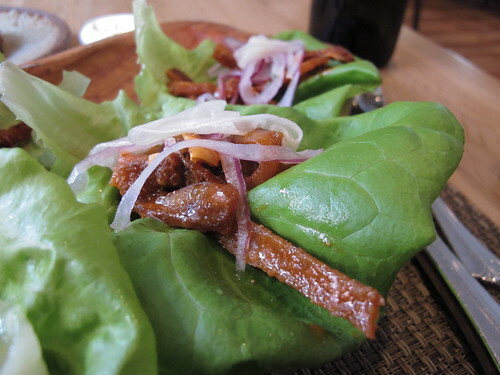 As loutish as it may sound, these lettuce wraps, to me, were the best parts of a buffalo chicken wing, the vinegary heat and crunch of freshly fried skin, combined with a distinctly pork flavor. Amazingly, the cucumber, red onion, and cilantro not only compounded the crunch of the pig ear and lettuce, they also provided a tempering effect to the heat of the buffalo sauce in a flavor oddly similar to ranch dressing. Although it may be a full blown cliché at this point, I still enjoy seeing a restaurant take a new and creative look at an old and decidedly simple dish. In this instance, I’m referring to the HUSK fried cheddar bologna. 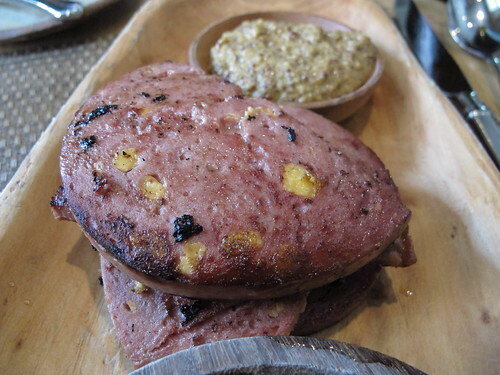 Even though my grandmother never bothered with the cheese studded variety, I still remember the sizzle of fried bologna when she would cook a quick meal. Of course, she never used a thick, homemade bologna like this. 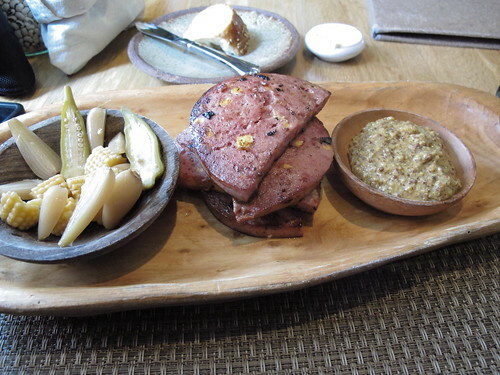 Pan fried till smoky and charred on the edges, this bologna was dense and greasy but it had an odd mix of textures. While some bites were silky and delightful, the majority was overcooked and a bit chalky. Any novelty and goodwill this dish may have had quickly faded and I was left with a plate of overcooked emulsified meat. If I had to pick one dish as the highlight of meal not to mention the highlight of Charleston, it would have to be the SC shrimp and grits. 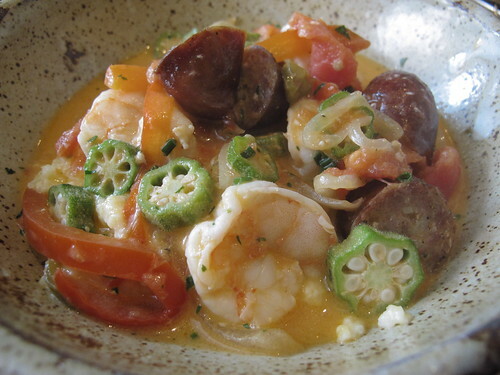 A distinct departure from the Tabasco dominated flavors of Hominy Grill’s version of the iconic dish, these shrimp were complimented by tomato braised peppers and onions, okra, and surry sausage. Each component of this dish was a standout: the Surry sausage carried a good snap to the casing with a flavor similar to un-smoked andouille, the shrimp were perfectly cooked and a bit spicy but well balanced with brininess, and the tomato braised onions and peppers were rich and dense with their inherent flavors. When combined, this plate of shrimp and grits was a celebration of late summer supported by a warm, sublime taste of tomato. 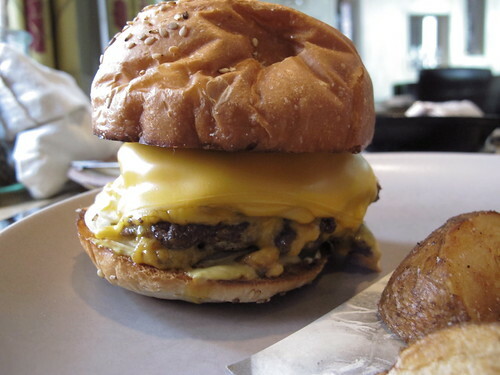 Hardly a dish unique to the South, it’s still hard to turn down the promise of a well made cheeseburger. If the allure of gratuitously melted cheese isn’t enough to weaken your willpower, patties made with bacon might do the trick. 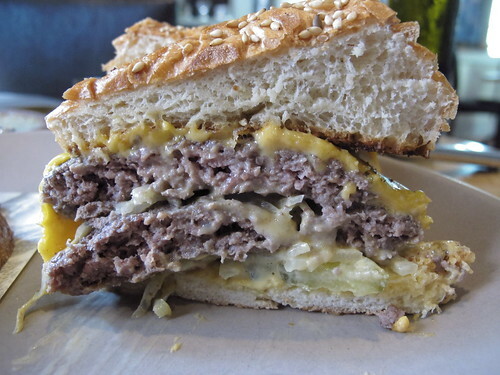 Unfortunately, there was a downside to a bacon beef patty, Husk will not serve a burger cooked less than medium rare. As you might expect the patties weren’t dripping with juiciness but the smoky flavor of the bacon helped things along. 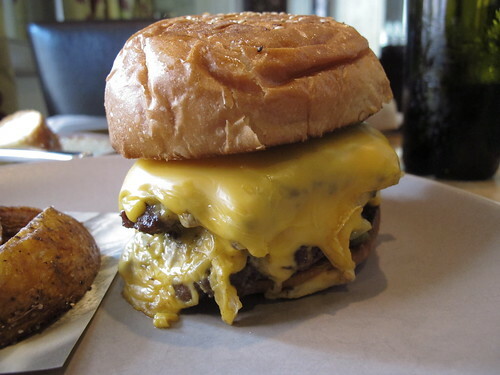 Regarding the other burger components, the buttermilk bread bun was perfectly sized for the patty, a little tangy, and well suited to the overdose of beef and cheese. While I may have had better burgers and even a better bacon burger, the Husk cheeseburger was still an above average choice. Simply because a cheeseburger can only be better with a side of potatoes, the Husk cheeseburger came with a side of fried potato wedges. 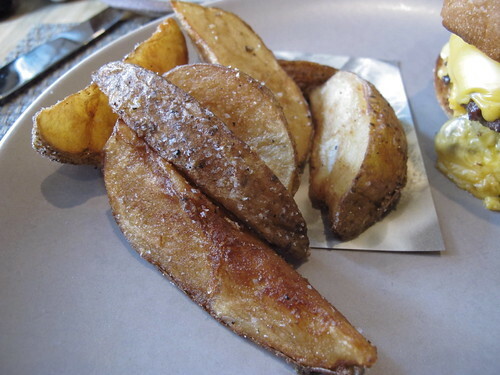 I’ve never been a fan of potato wedges, preferring the crunch of Belgian style frites over the pillow texture of a wedge, but these potatoes made a good argument for accepting the wedges into the fold. Piping hot and with a fluffy texture, the only downside was a heavy-handed approach with the salt. 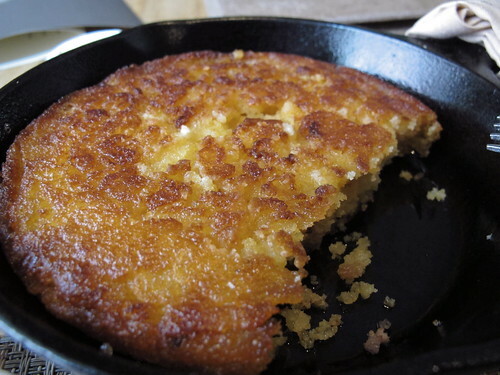 If there’s a better way to test the mettle of a southern restaurant than cornbread, I can’t think of it. 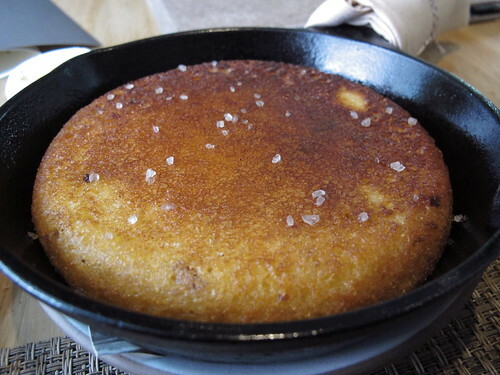 Brock doesn’t pull any punches with his cornbread, made with Benton’s bacon and served in a cast iron skillet, this side has the chops. There’s not much I can say about this cornbread that doesn’t come in the form of praise. From the well seared and golden brown crust to the salty taste and not too crumbly interior, this could well be the poster child for southern cornbread. If there was one downside, I decided that this cornbread didn’t mesh well with the honey pork butter, but that’s no matter, it’s good enough on its own. Leaving the Queen Street building, I began to think about Sean Brock and Husk’s notoriety. I had wondered if it was all earned or completely overblown. After this lunch, I had little doubt in my mind that Sean Brock is doing something special at Husk. There may have been a cheese studded misstep but on the whole, my meal at Husk was a celebration of southern cuisine (low country in particular) with local and seasonal ingredients. While I feel that a full dinner would have been a better introduction to the Brock’s world of food, any restaurant that makes cornbread that well and makes me crave crispy buffalo pig ears is doing a few things right. There’s certain feeling of elation when you receive a wedding invitation in the mail, particularly when it’s a couple you’ve known since day one. However, happy as I was to be invited to the ceremony, I was equally excited to see their choice of city, Charleston, South Carolina. Some may call it a problem, I simply call it planning ahead but after reserving a hotel room, the first thing I did was begin to research where to eat. While I was researching, I found it hard to believe that is had been four years since I was last in Charleston. In that time, I’ve had little more to do than salivate over the mountains of food press the city has garnered. With Sean Brock of Husk leading the charge of the kitchens and John T. Edge, Garden and Gun, and the food magazines providing the ink, the low-country city has more than secured a reputation as a food lovers’ destination. Speaking of Husk, while that may have been my first choice for Friday dinner, a 10 pm reservation forced me to keep looking. Scanning through various blogs, chowhound threads, and major magazines, it seemed that if Husk was number one, Hominy Grill was never far behind. 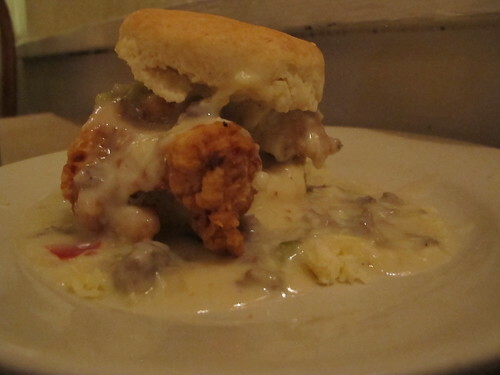 While scrolling through YouTube, I found an episode of No Reservations where Bourdain attempted to finish a mountain of biscuit, chicken, and gravy called The Big Nasty. With that my mind was made up; a phone call was made and soon Hominy Grill was my Friday dinner destination. If there was one thing I had underestimated it was the time it takes to drive from Kiawah Island to Charleston. It’s not the distance or the speed limit; it’s getting stuck behind a driver who decided that 5 mph below the limit is just too fast for his blood. 45 minutes or so after leaving the island, I was ready for a drink and to see if Hominy Grill could live up to its fame. After a short wait and playing audience to a fundamental misunderstanding of the definition of “pescaterian”, I was shown to my table and greeted with a cardboard tray of boiled peanuts. 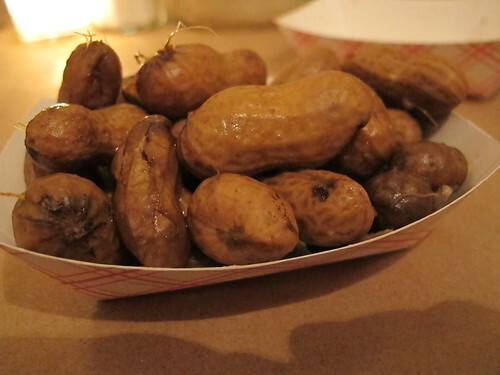 Even though I’ve never been much of a fan of boiled peanuts, these groundnuts were a fine example of the breed. Served warm, these peanuts were juicy and not too salty. Tender and meaty, there truly was just enough salt to highlight the natural peanut flavor. Good as the boiled peanuts may have been, I pushed them away in an effort to save room for the two trademark Hominy Grill dishes, the shrimp & grits and The Big Nasty. Unfortunately, there was a bit of a misunderstanding as both dishes appeared at the same time. Forced to choose one to fully enjoy, I started on The Big Nasty and let the shrimp & grits begin to cool. 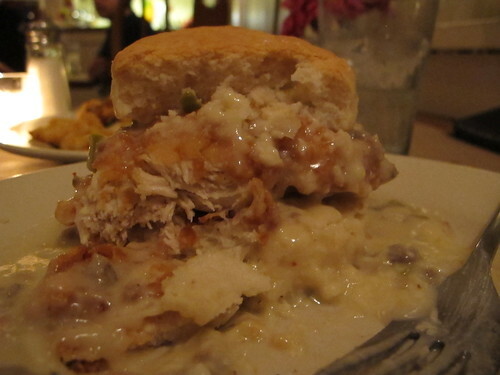 When presented with a fried chicken breast, cheddar cheese, high-rise biscuit and sausage gravy, it’s hard to know where to begin. Trying each component on its own, it was the sausage gravy first. Creamy and with each bite carrying a lingering pickled pepper & vinegar tail, there was hot sauce at work with this mix of sausage and gravy. 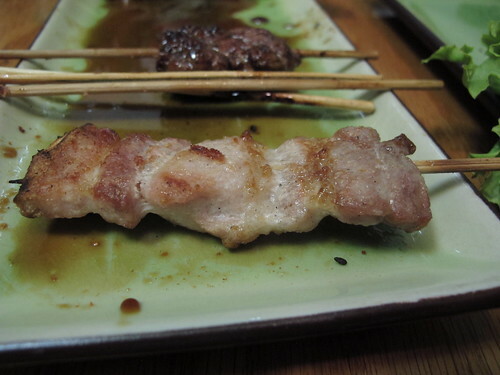 Usually the weak point of any dish, this piece of fried breast meat was juicy and an able player in this dish. 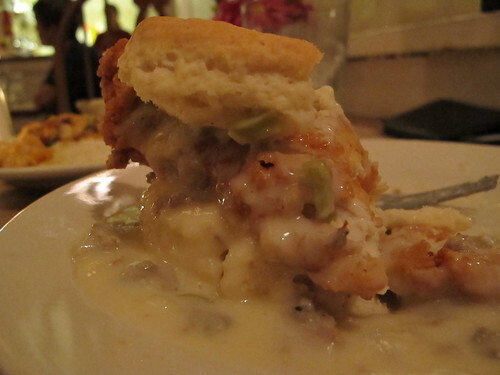 As for the high-rise biscuit, it was a thick, dense, and a bit floury. Nothing too special on its own, it worked quite well with the fried chicken and sausage gravy. 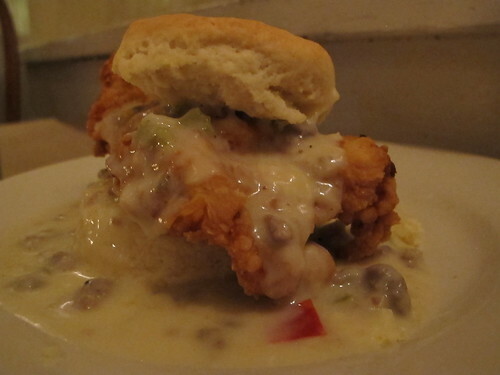 All together, this is certainly an above average chicken and biscuit, but I’m not too sure about its status of as a “50 Best Southern Foods” side dish. 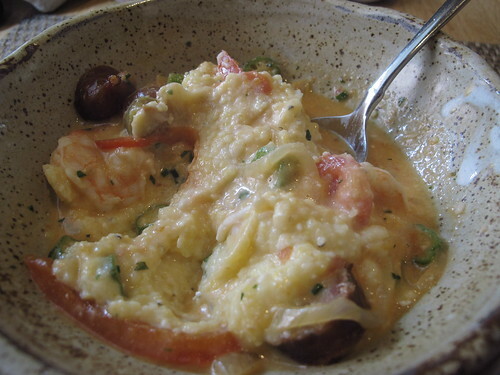 While I was working on my biscuit and gravy, my waitress had noticed the untouched shrimp & grits. Telling me they were best fresh from the kitchen, she offered to bring me a fresh order when I was finished with The Big Nasty. 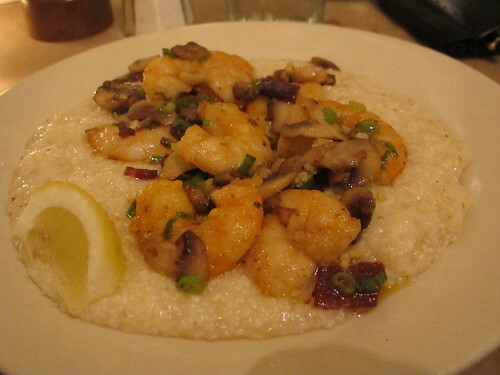 Once I was done with chicken and biscuit, a fresh order of the house specialty shrimp and grits was brought to my table. Piping hot and brimming with shrimp, mushroom, scallions, and bacon, this was what I come to Hominy Grill hoping to find. 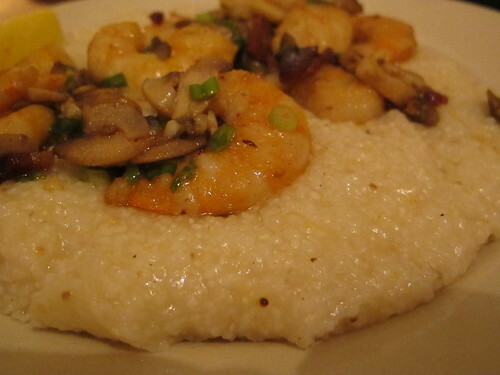 With the cheese grits acting as a canvas for the shrimp and the aromatics, the flavors really had a chance to bloom. Sadly the shrimp were boiling hot and overcooked but when combined with the vinegar laced spiciness of the other components this dish worked decently well. Despite the occasional sand vein, I was more concerned with the overwhelming hot sauce flavor. My waitress later revealed the kitchen used Tabasco and judging from the flavor of the dish, they weren’t shy about it. I’d be lying if I said I wasn’t disappointed in my meal at Hominy Grill. While I wasn’t expecting a low country epiphany, I wasn’t expecting a dinner presented by McIllheny either. The Big Nasty, for all the hoopla surrounding the biscuit, was surprisingly mundane. Nothing particularly wrong with it but I’d put the Cathead biscuits from Big Bad Breakfast in Oxford to be an equal if not superior choice. 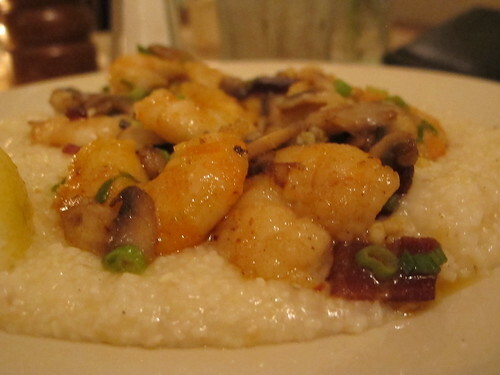 As for the shrimp & grits, this version, forgetting the overcooked and sandy shrimp, relied too heavily on the vinegar flavor of Tabasco. 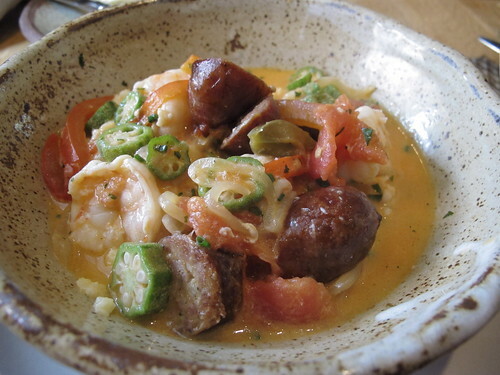 With a lunch at Husk to look forward to, I still had hope for this Charleston trip, but Hominy Grill wasn’t getting things off to a good start.